Engineers at combined cycle gas turbine (CCGT) electric power generation plants will find the ST100 Air/Gas Thermal Flow Meter from Fluid Components International (FCI) features a fast- response direct mass flow sensor for the close ratio control of natural gas and air feeds to support turbine safety and improve efficiency. Combined cycle power plants operate with both natural gas and steam turbines to produce up to 50 percent more electricity from the same fuel as traditional fossil fuel power plants. The steam turbine is driven by the waste exhaust gases from the natural gas turbine. To operate safely, the gas turbine must receive an exact, controlled air-to- fuel ratio mixture. Such control is achieved by closely monitoring the ratio of the air (oxygen) and the fuel, which is typically natural gas. This ratio is also known as stoichiometric mixture. Both the air feed and the flow rate of natural gas must be measured accurately, and even more importantly, repeatable accurate and reliably. The flow meter also must operate over a wide turndown range for safe start-ups and restarts of the gas turbines. Installing a direct mass device such as FCI’s ST100 Thermal Flow Meter in the process control loop offers a number of advantages. It allows the operator to achieve a direct ratio of control between the natural gas, the air and waste gas fuels without any corrections for pressure, temperature or density, which requires extra components and possibly extra offsets and failures. FCI’s thermal flow meters with their direct mass flow sensors are installed at dozens of CCGT power plants throughout the world. They measure the mass flow rates of both natural gas and air in line sizes from small 1-inch gas pipes to large 2000-x- 2000-mm air inlet ducts. The ST100 and other thermal mass flow meters from FCI are applied not only on CCGT plant cold fresh air intakes, but also at preheated or combustion air feeds to the gas turbines. Their SIL rating is based on certified Failure Mode Effects and Diagnostic Analysis (FMEDA) reports, assuring plant operators of highly reliable and repeatable flow data. FCI’s ST100 Flow Meter is an innovative thermal dispersion technology gas flow meter. It combines the most feature- and function-rich electronics with the industry’s most advanced flow sensors to achieve a truly state-of- the-science flow metering solution for industrial processes and plant applications. It is ideal for the measurement of air, combustion air, oxygen, natural gas, synthesis gas, methane and many other process gases. 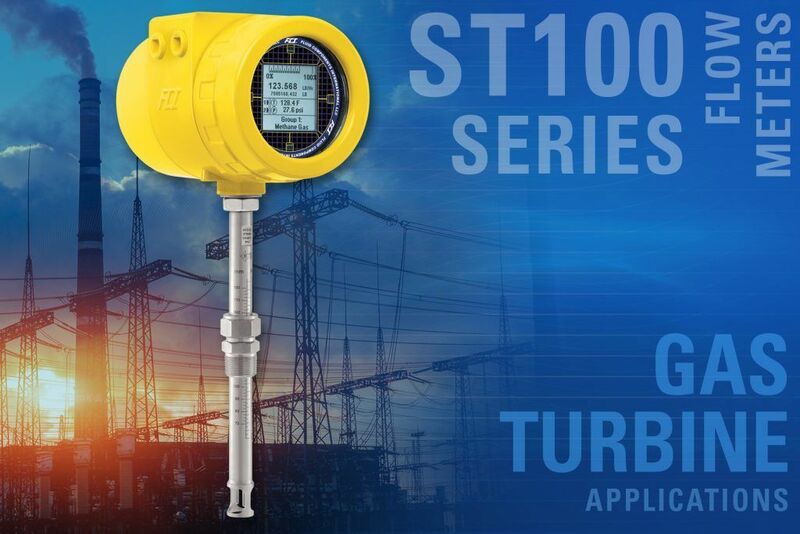 With its fast response thermal dispersion direct mass flow sensors the ST100 Flow Meter meets 1 Tau within 1 second, making it ideal for close ratio control in CCGT applications. The standard turndown is 100:1 with an optional 1000:1 turndown available– again a perfect fit for CCGT operations. The ST100 Flow Meter’s in-line style configuration is for line sizes from 0.75 to 2 inches and measures flow rates from 0.01 to 3000 kg/hr. The insertion style is for line sizes from 3 inches to 6000 mm and measures flow rates from 1 to 1.000.000 kg/hr depending on line size. Developed for rugged industrial processes, the ST100 Flow Meter is compatible with operating temperatures from -40 to 850°F (-40 to +454°C). Along with a SIL 1 rating, the ST100 meter is certified for hazardous areas with comprehensive approvals that include FM, FMc, IECEx, ATEX, Inmetro, EAC, NEPSI, CPA and others. Whether the output requirements for a CCGT application are traditional 4-20 mA analogue, frequency/pulse, or advanced digital bus communications such as HART, Foundation Fieldbus, PROFIBUS, or Modbus, the ST100 supports them all. The ST100 meter’s bus communications have been certified by and are registered devices with HART and Foundation Fieldbus. The ST100 Flow Meter’s optional digital readout provides a best-in- class information suite, backlighted LCD and four optical touch buttons. The display and button functions can be rotated electronically, via the buttons, in 90° increments to optimize display viewing and button activations.